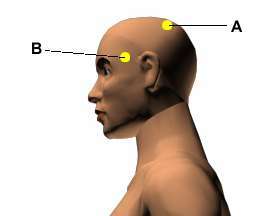 There are the acupressure points for improving Memory & Concentration. Working on these points can help you get better quicker. You do not have to use all of these points. Using just one or two of them whenever you have a free hand can be effective. Location: On the crown of the head in between the cranial bones. To find the point, follow the line from the back of both ears to the top of the head. Feel for a slight hollow toward the back of the top of the head. Benefits: Good for mental concentration and improving memory; relieves headaches. Location: In the depression of the temples, one-half inch to the outside of the eyebrows. Benefits: Improves memory and concentration; relieves mental stress, headaches, and dizziness. Location: Below the base of the skull, in the hollows on both sides about two to three inches apart depending on the size of the head. Benefits: Remedies headaches, poor memory, and relieves arthritic pain that inhibits the ability to concentrate, regardless of the pain’s location. Location: One-half inch below the base of the skull on the ropy muscles one-half inch outward from the spine. Benefits: Relieves stress, burnout, overexertion, heaviness in the head, and unclear thinking. 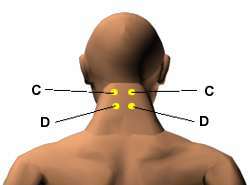 This point will help relax your neck allowing greater circulation into your brain. Location: Directly between the eyebrows, in the indentation where the bridge of the nose meets the forehead. Benefits: Good for improving concentration and memory; clears the mind and uplifts the spirit. Location: Two-thirds of the way up from the upper lip to the nose. Benefits: Improves memory and concentration, and relieves cramps, fainting, and dizziness. The effectiveness of this point often increases by pressing it firmly each day over a period of several weeks. Location: On the center of the breastbone three thumb widths up from the base of the bone. Benefits: Aids concentration; relieves nervousness, chest congestion, insomnia, depression, anxiety, and other emotional imbalances that inhibi! concentration and clear thinking. Location: Four finger widths below the kneecap, one finger width outside of the shinbone. If you are on the correct spot, a muscle should flex as you move your foot up and down. Benefits: Strengthens the mind and body as well as aiding mental clarity. Location: On the top of the foot, in the valley between the big toe and the second toe. Benefits: Relieves poor memory, headaches, fatigue, and poor concentration.